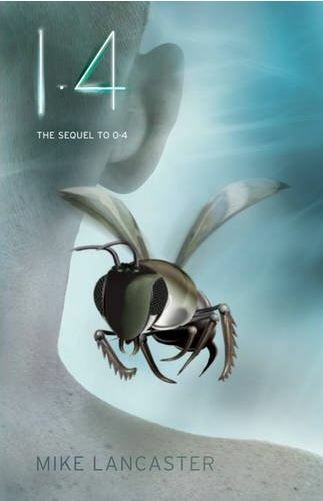 Mike Lancaster’s 0.4 is one of my favourite books and the best science fiction story I’ve read. I read it just before the February 2011 earthquake in Christchurch so I was distracted by everything that was going on and didn’t get the chance to tell everyone how amazing it was. It’s the story of Kyle Straker, a teenage boy living in a small village in England, who wakes up after being hypnotized to find his world a very different place. It hooks you in from the first line and you don’t want to put it down until the last word. 1.4 is Mike Lancaster’s sequel to 0.4 and it’s just as addictive. 1.4 is an upgraded, even better story than 0.4. The story takes place 1000 years after the events of 0.4 and Mike shows us his incredible vision of the future. It’s a future where bees have died out and been replaced by robot bees, humans can connect to technology and each other through filaments that come out of their bodies, and they are constantly connected to technology through their Link. The story is told through the LinkDiary entries of Peter Vincent, whose father invented the robot bees, which many people believe saved the world. There is a small section of society who believe that the Kyle Straker tapes are real and that the events of 0.4 actually happened, but these people are treated like second class citizens and live in slums. Amalfi (or Alpha) is a Strakerite who goes to Peter’s school, and when she asks for Peter’s help to find out what has happened to her father, their world is turned upside down. The thing I like most about 1.4 is the way that Mike Lancaster has woven the two stories together. If you’ve read 0.4 you know why society is so technologically advanced and who the ghosts in the photos are. I also really like that Mike doesn’t let relationships between his characters get in the way of the story, like many female authors tend to do. Having said this, his characters are still interesting and you empathize with the situation that they’re in. 1.4 is a smart science fiction story with lots twists and turns, freaky technology, and hidden truths. If you haven’t discovered Mike Lancaster, you don’t know what you’re missing.